Our 6th Annual National Night Out is finally here! 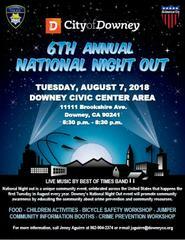 Come join City of Downey's Police Department in celebrating and promoting Safety and Crime Prevention alongside many vendors and local Non-Profits that will have informational booths, raffles, children activities, and food. 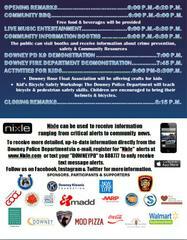 Enjoy entertainment by Best of Times Band, a K9 Demonstration, and a big splash performance by The Downey Fire Department along with CPR Demonstration.